Market Rasen cricketer Paul Martin rubbed shoulders with international stars at an eventful Grimsby Town Knock Out last week. Paul was named in the Lincolnshire Development XI who took on a Lincolnshire Cavaliers side containing Australian limited overs all-rounder Glenn Maxwell and England wicketkeeper-batsman Johnny Bairstow. The Australian, who opened with Bairstow, was out for just four when Ross Carnelly took an excellent catch off Matt Roberts. In contrast, the England player made 57 before being skittled out by Grantham junior Louis Greetham as the Cavaliers closed on 181-7. In reply, Paul was out to the spin of Maxwell without scoring as the Development side were bowled out for 72, while Rasen skipper Matt Rutherford also claimed two wickets. Maxwell also took a stunning catch, while Bairstow pouched two catches. Cavaliers: G. Maxwell 4, J. Bairstow 57, O. Burford 29, S. Brown 51, L. Robinson 23*, T. Webb 3, P. Malone 0, S. Webb 0, M. Rutherford 0*, Extras 13. Total: 181-7. Bowling: M. Roberts 4-0-34-1; B. Powell 2-0-29-1; B. Brumby 2-0-18-0; A. Sreedharan 4-0-38-3; J. Brumby 2-0-46-0; L. Greetham 2-0-24-2. Development XI: R. Carnelly 22, S Ashraf 0, J. Dobson 2, A. Grimes 7, M. Roberts 11, P. Martin 0, B. Brumby 7, J. Brumby 6, B. Powell 11, A. Sreedharan 1, L. Greetham 4*, Extras 1. Total: 72. 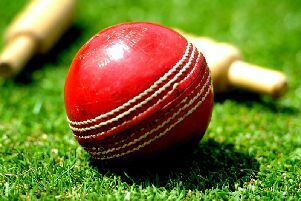 Bowling: K. Adams 4-0-18-4; D. White 1-0-18-0; G. Maxwell 2-0-15-1; S. Brown 2-0-11-2; M. Rutherford 1.1-0-10-2.